- this is the story of driving a Cobra roadster at Rossfeld Hillclimb. As you'll see, the hillclimb is different. It rains for days while he's trying to learn the road, his car turns out to be a clapped-out Cobra roadster with what feels like last year's engine, the road surface is miserable and he works extremely hard on the official climb only to go slower than he had in practice. It's the story of a frustrating series of events in a not-too important hillclimb. And even though Bob does win the over-2liter class, the best he can say for it after its over is - that he "wasn't very happy with the way things went." ROSSFELD is the name of a mountain near Berchtesgaden, Hitler's retreat during World War II, and is a beautiful little village located at the foot of the Alps in lower Bavaria just 12 miles from the Austrian border. Many of the townspeople still dress in their native costumes, making it a very colorful village. I found the people were friendly and highly enthusiastic about the coming hillclimb, which was on the international calendar and counted toward the manufacturers' championship. WhIch was why we were her~-to win points that would help Cobra win the championship. I arrived on Monday in order to become accustomed to the altitude, to get relaxed and also learn which way the hill went. I had never run Rossfeld before though I did do a couple of other hills in Cobras in 1964. On a hillclimb, I have found it to be very important to memorize each turn and every inch of the road, no matter how long or short it is. This is of great importance on a hillclimb because of the way you are scored. On race day you are allowed only two runs and your official time isn't the best of the two, it's a combination of the two. So you can't afford to make even one mistake or you've lost the race. It isn't like a road race where, if you make a mistake on one lap, you still have 40 or 50 Iaps to make up for ft. It started raining the evening I arrived and rained night and day for the next four days, so naturally I learned Rossfeld in the wet. The road surface was deceiving. At first glance, it looked quite good and as if it would be fast. On closer examination, however, I could see that what looked like a new surface at first was only fresh tar and pea gravel brushed over the same old bumps and dips that had been there for years and years. The condition of the road didn't make me very happy, but these are the things you must find out before the race so you can find the smoothest, quickest way up the hill, which is not always the standard, correct line you hear so much about. Rossfeld is comparatively short for a hillclimb, only three and a half miles, but you climb about 2000 ft. In that distance you negotiate 31 turns, of which five are hairpins, or what- I call first gear turns. The rest is comparatively fast, although you never get into fourth gear in a hillclimb. If by some unfortunate circumstance you should go off the road on the way up, you would meet with almost certain disaster in the form of pine trees, or a very long drop to a rocky ledge, or to the road you'd driven on coming up. So it pays to be careful. Our Cobras were supposed to arrive on Thursday in time to be checked over before a test run on Friday and official practice on Saturday. I was to meet them at about noon at the local Ford garage where we were to keep the cars, but the transporter had mechanical trouble on the way and was several hours late. I was to drive my last year's car, a Cobra roadster, the same snake we'd used at Nurburg Ring for tire testing and for practice. The other car was a brand new one, a street machine that had been converted to a race car. This one had my Nurburg Ring engine in it out of the Daytona coupe, so it was pretty good. Due to lack of time, my roadster had what felt like last year's tired-out engine. On Friday afternoon I took my car up the hill. It was still raining quite hard, but for a change this was what I wanted, as I was trying out some new Goodyear rain tires. The road was still open to the public, so there would be 2-way traffic. 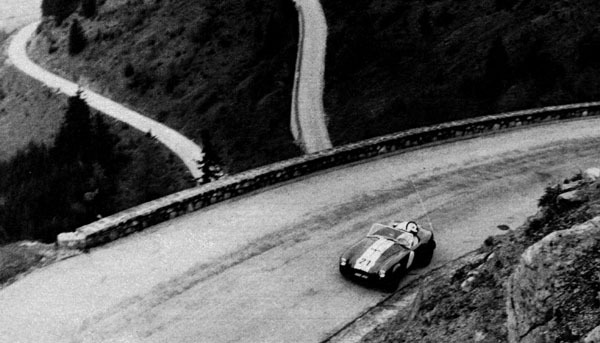 Shades of the Targa Florio. As I got to the start I found there was a Jaguar XK-E and a Porsche that had the same idea, so I let them go ahead of me. I thought they would meet the unsuspecting tourists first and while the tourist was still terrified and huddled by the side of the road, I could blast by in a wet 4-wheel drift and not have any problems. I hoped. This worked out fine the first time up the hill, but the rain made it really slippery and the road surface felt as if it had about 10 times as many bumps as I'd anticipated. In my road car, which had a lot less power and much softer suspension, the road had felt comparatively smooth. So I now found out that in the Cobra it was much worse, and at even the comparatively slow speed I was going in the rain, the car was airborne about 20 percent of the time. After I returned to the bottom I let the tires down and tried it again. This was a little better and at least the car didn't feel as if it were going to shake apart. However, this time I met three other cars that appeared to be practicing-only in the wrong direction. So I decided it was getting dangerous and returned to the garage. I had accomplished what I had intended, as I'd found out the new Goodyear rain tires felt much better than the previous ones and I thought with the shocks softened a bit we'd be in business if we had to run in the rain. On Saturday, the official practice day, I awakened to find a beautiful, sun-filled sky. The mechanics were up early loading the spares and tools into a small van we were going to take up the hill. The other driver, the well known Swedish rally driver Bo Ljungfeldt, and I had breakfast with Howard, the Alan Mann Racing Team's assistant manager, then went up to the hill for practice. Up on the hill, our practice times got better and better but I found, due to the high altitude, we had literally lost our torque. The cars had been set up in Byfleet, England, according to what we had learned last year at Freiburg and Sierra Montana, so no carburetor jets or anti-roll bars were brought along to try. My engine was not only tired, but was also so rich that it would hardly run. The mechanics did what they could, but both our cars were in sad shape companed with what they should have been. It was frustrating. Despite our problems, though, we were starting to turn competitive times. On one run I decided I would see what I could do. I had been working on three separate turns I felt must be flat in third. So I decided I would try at least two of them on this run. As soon as I entered the first of them, a left-hander which exited into a very fast right, I knew I should never have tried it flat. I stayed flat, though, because you can't change your mind in the middle of a turn like that, and pitched the car sideways. That scrubbed off some of my speed and I just made it.. The next turn I approached with a trailing throttle just in case. This 'one wasn't quite as bad and only made my heart work a little harder. When I got to the pits via a spectacular return road which led through some beautiful back country, I saw my mechanic Ernie was wearing a big broad smile so I knew something must be good. He told me I'd turned in a time of 3 min 15.2 sec for the trip up the hill, which was almost a second quicker than the previous prototype record set in a Porsche by the late Edgar Barth. Bo Ljungfeldt had never driven a Cobra before, but he was down to 3:25 already. A few minutes later we heard that Muller, the Swiss hillclimb expert, had just turned in a 3:14.7 in a Porsche 904.I would have liked to have given it another try but Howard said let's pack it up and save it for tomorrow. In the meantime, the prototypes were going very quickly indeed. Mitter, in one of Porsche's new special-built hillclimb cars turned a 3:07.4, a new outright record. My time was fourth overall for practice. On race day the weather was cloudy but dry in the morning, then it got cloudier and there was a threat of rain in the afternoon. This was an international event counting toward the world manufacturers' championship, but it was being run more like a club hillclimb. The organization was really pretty casual and there were only about a dozen competitors who seemed serious about it...: There was lots of enthusiasm among the spectators, though, and people lined the hill all the way up, even with the weather the way it was. The touring cars were first up, followed by the GT cars, then the prototypes. I made my first run at 11 :00. From the startingline you blast off in a straight line up to a roughly surfaced hairpin, up a, short straight to a slow right-hand S-bend and then you are into the real climb section. I was amazed to find I had even less power than I'd had the day before. In a straight line, or accelerating out of a corner, there was just nothing there. So I went deeper into the corners to try to make up the difference. When I reached the top found I had only turned a 3: 19.5, 4 seconds slower than I'd gone in practice. And that was working extremely hard. Ljungfeldt in the other car had made it in 3:22 flat, which was very good. Our next run was at 2:30. Between runs it sprinkled a little, then stopped. The mechanics kept the rain tires close by ready to change at the last minute if it was necessary. At 2:30 it looked like rain but hadn't started yet, so I said I'd take a chance and go up on the dry tires. They were smaller in diameter and with the little power I had, I thought they would work better than the big rain tires. I got off to a good start but when the road got steep I still had the lack of power problem. As I neared the finish it started to sprinkle again, so only the last three turns were wet and slippery. This time I turned a 3:19.7. Ljungfeldt had started in front of me, so he missed the rain and turned in a fantastic time, I thought, for being a new car, 3:19.1. 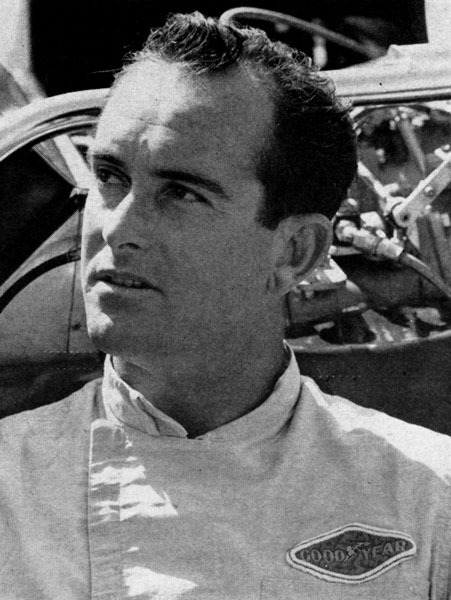 Mitter won overall in the Porsche prototype with an outright record of 3:06.7 and Muller, the Swiss driver, set a new GT record of 3:12.8 in the Porsche 904. Muller also won the under 2-liter class, but my time was good enough to win the over-2liter GT class-and the all-important championship points. As you can tell, I wasn't very happy with the way things went at Rossfeld. The weather was bad, the road was not all it could have been and my car was a real disappointment. But that's the way things go sometimes.